I added some new challenge ideas to my list the other day and one of them was to create a monochromatic layout. I thought that it would be a fun challenge to take on, especially in the wedding album I have been working on. 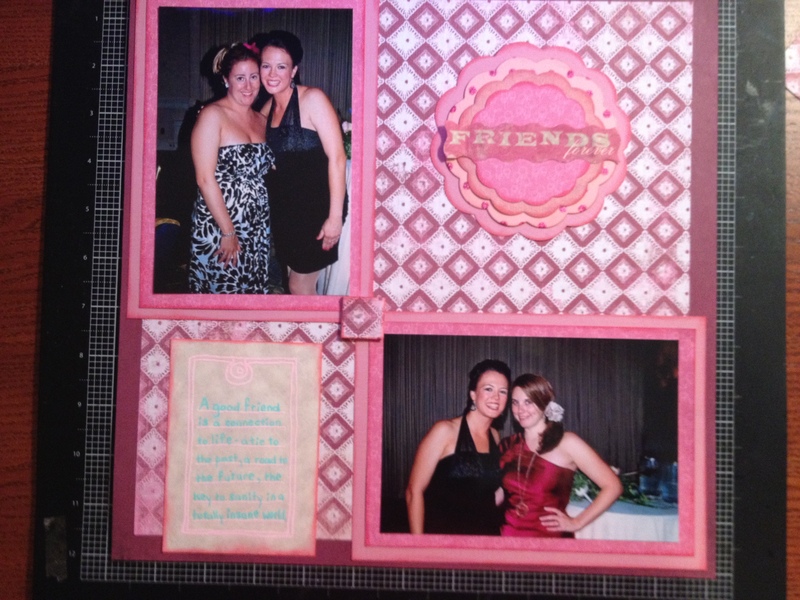 For this, I chose a layout with two pictures of my sorority sisters from Erika’s wedding. 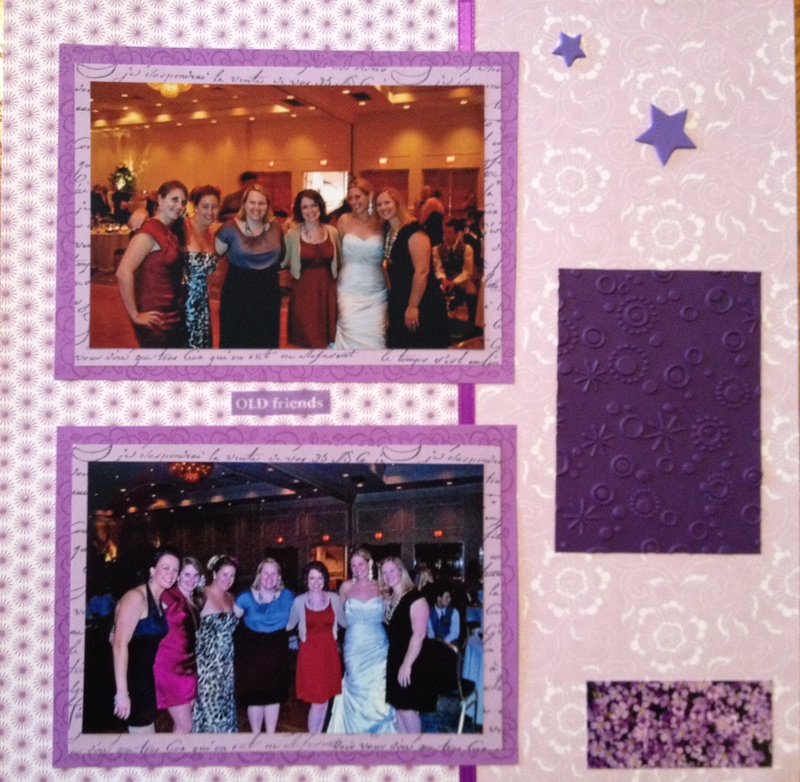 The background paper that I had picked for this layout was two-toned purple flower bursts with a little bit of sparkle. First I looked through my scraps for any purple paper that I could use on this layout. 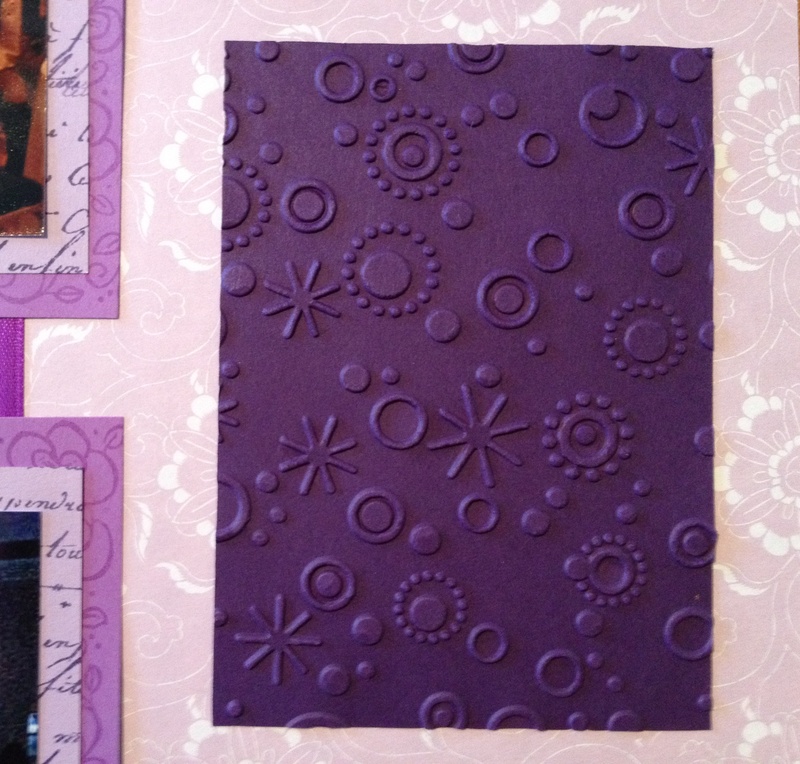 I found two different shades of solid purple paper that I used as mats around the photos. I then took a 12×12 sheet of light purple paper that has white flowers and cut that down to a 5×12 sheet to use as a border on the right side of the page. To make the transition between the two patterned papers less noticeable, I used a dark purple ribbon. Next I went through my stickers and found several purple ones – one that says OLD Friends, another one that is purple flowers and some purple star stickers. The significance of purple is that the girls in these two pictures are some of my sorority sisters and purple was our color. I thought that this would make it fitting to have an all purple layout! When I matted the pictures, it looked boring. So, I took the larger, darker photo mat and a row of flowers stamp, used VersaMark and stamped the outter edges of the mat. Doing this creates a watermark effect (a slightly darker colored image than the background paper). For the smaller, lighter mat, I took a handwriting stamp and some Dusty Concord distress ink to create the background. After all the layers were glued together, I placed them on the page to see how the page was coming together. I glued the purple and white flower patterned paper to the background sheet and then adhered the ribbon over the seam between the two sheets. 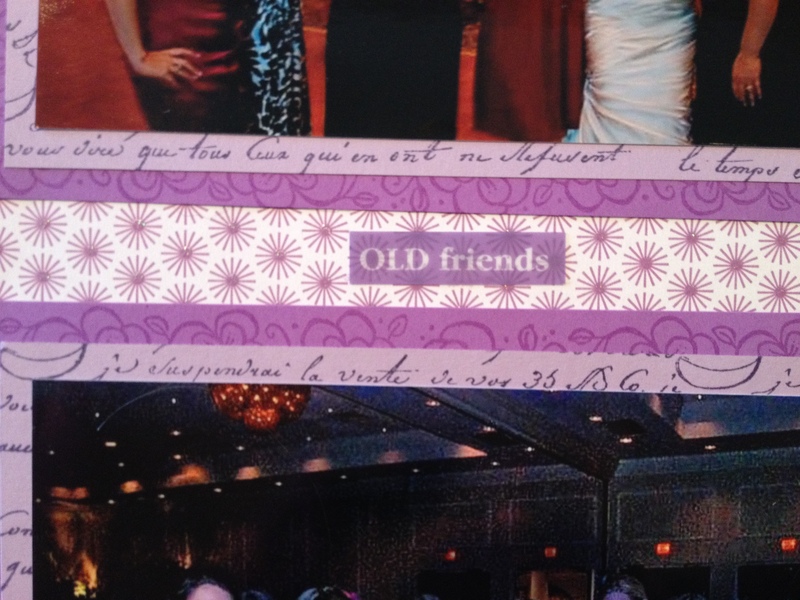 The pictures were afixed to the page next and then I placed the “OLD Friends” sticker between the two photos. The empty space on the right side still needed something. Hope this gives you another idea to create a page or two of your own. As always, feel free to leave comments! Posted in Challenge, distress ink, Embossing Folders, ideas, scrapbook tips, stamps, starting a project, VersaMark and tagged challenge, distress ink, embossed image, monochromatic, ribbon, stamps, VersaMark. Bookmark the permalink. For this challenge I needed a page that only had one picture. This was difficult because I usually like my layouts to be photo intensive. 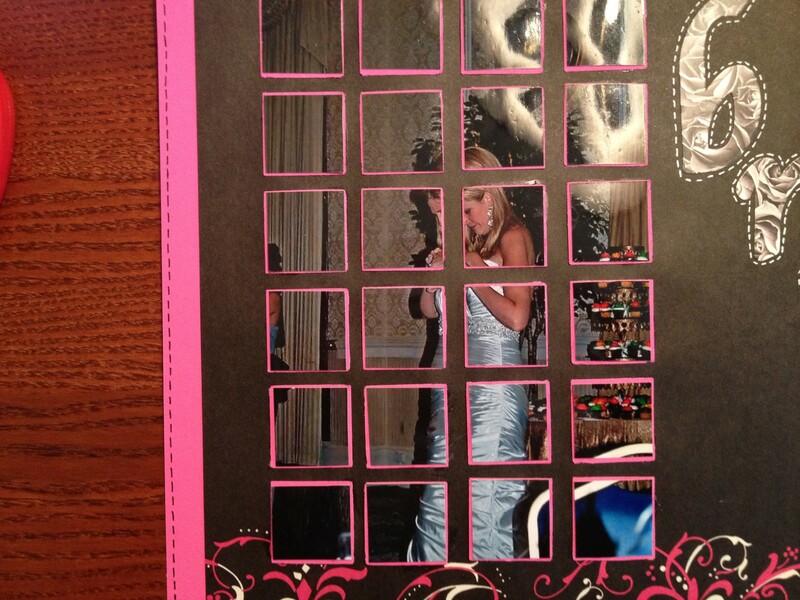 I went through the scrapbook that I have been working on for most of this challenge and I found a page that had a single picture of the bride. I had already chosen the background paper and then I decided to trim down two of the sides by an inch so that I could attach it to a dark pink piece of card stock. This challenge is about creating a mosaic. I turned the photo over and placed it on my self-healing mat, which also has measurements on it. I took a ruler and a pen and very lightly made one inch marks vertically and horizontally until I had 24 boxes. 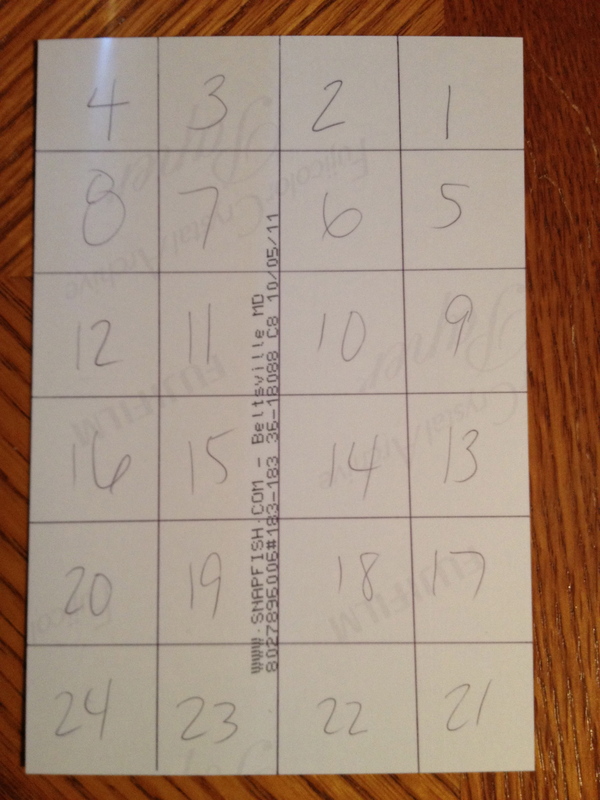 I then numbered each box 1 – 24, starting in the top right corner and working to the bottom left corner. Using my paper trimmer, I cut the photo along the lines I had drawn and placed each piece, face up on my work space. 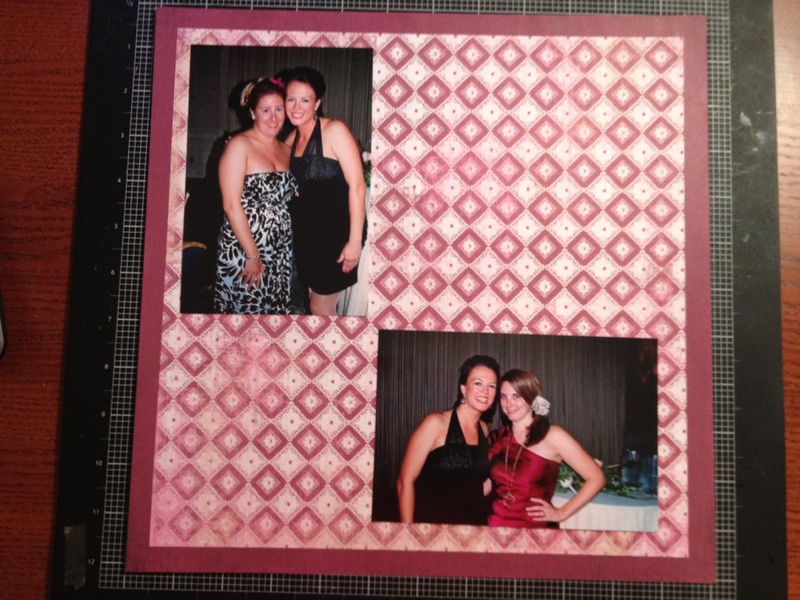 I then took my small square punch and used the same color paper as the background to cut out squares that were slightly larger than the photo pieces. 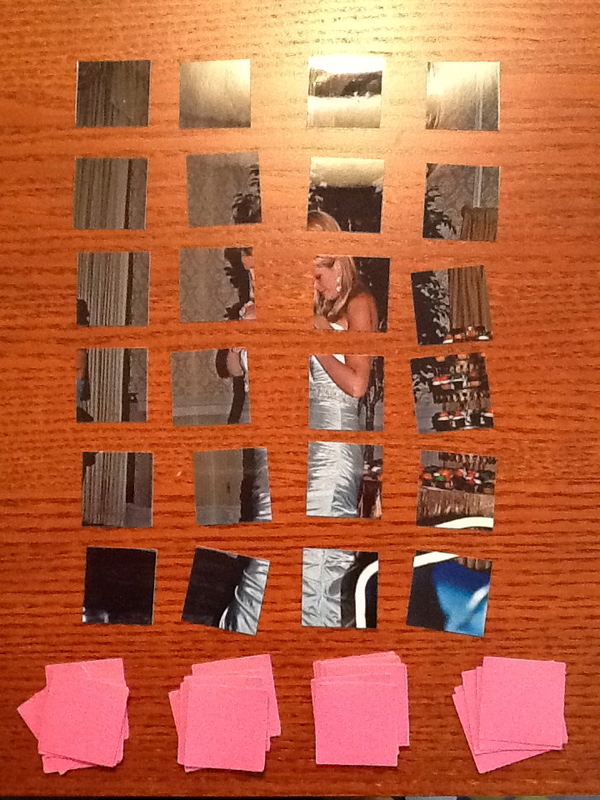 Once all the pieces were glued to their backing, I placed them on the paper to determine where they would look the best. The next step was to put the mosaic together. I glued all of the parts to the background paper. Here is what the mosaic looked like right after I glued it down. Since the mosaic was on the left side of the layout, something needed to go on the right. I chose a sticker of the word “Bride” where each letter contained black and white roses. Because it was going on to a black background, I thought that using a white gel pen and faux stitch around each letter would make them stand out. It also matched the stitching that I did on the dark pink border paper. Posted in Challenge, ideas, scrapbook tips and tagged challenge, mosaic, paper trimmer, square punch, wedding. Bookmark the permalink. 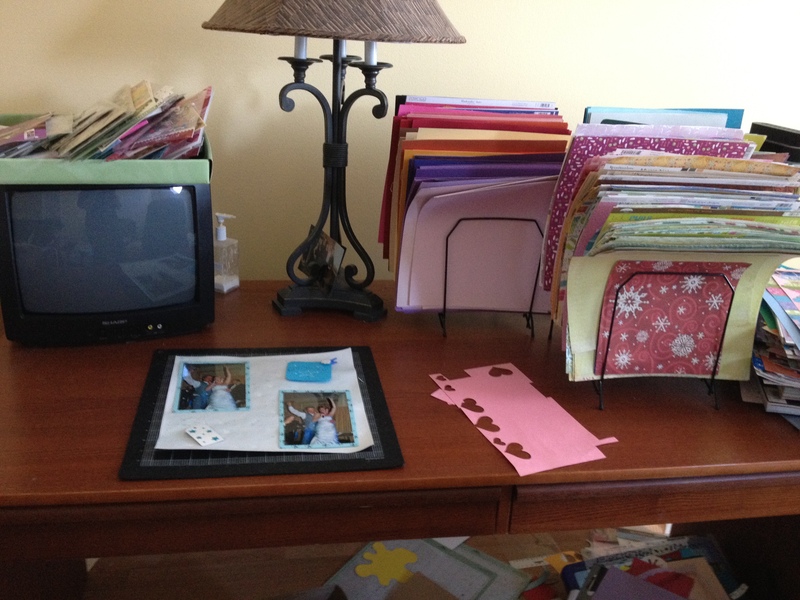 For me, the hardest part of organizing my scrap room is all the paper I have. While I am still working on a way to organize my paper packs, I found a way that I think works for my loose paper. When I was at Michael’s yesterday, they had Ashland storage baskets on sale for 50% off. I was looking for a deep basket that could maybe hold file folders. As I was perusing the aisle I came across a deep basket with an attached lid. I thought this might work to store the hanging folders as it looked just wide enough so that the hooks could rest on the side. When I tried, no such luck. 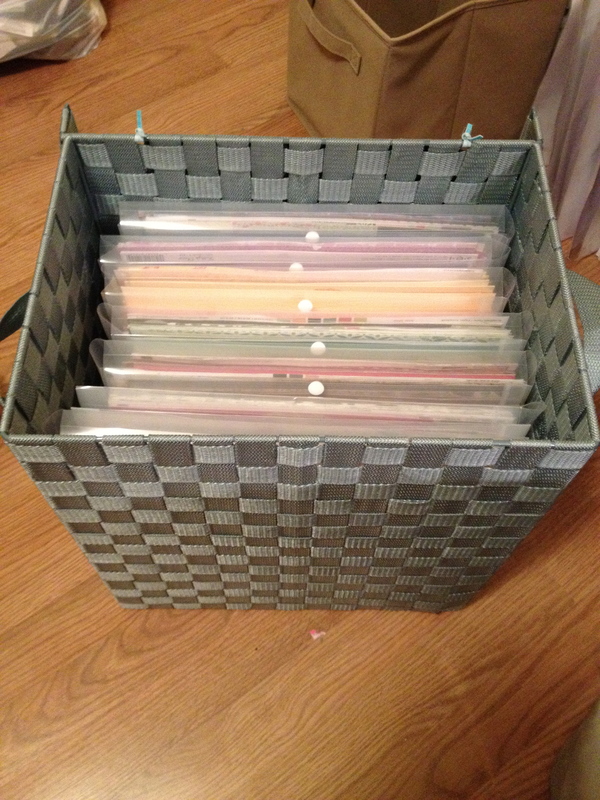 So instead, I picked up a package of Recollections plastic paper storage kits, which contained 10 units. They were $12.99 and then 40% off. 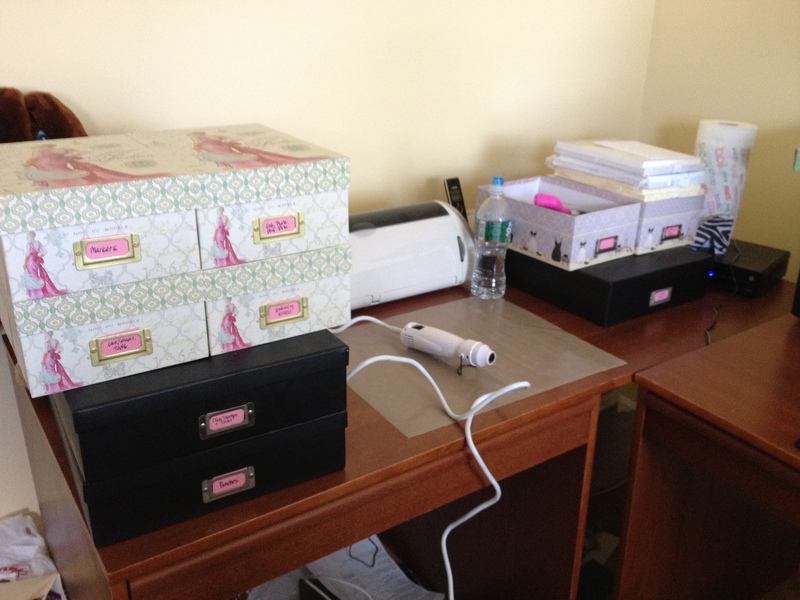 Until yesterday I stored my paper in a file folder rack. This caused the papers to fold over so they wouldn’t lay flat when I went to use them on a layout. I had the papers divided up into colors and then another rack housed the patterned papers, which were also divided by colors as best as I could get them. When I organized the paper this time, I put the patterned and solid colors in the same folder. For colors that I didn’t have a lot of paper for, such as orange, I combined them with another color. Once they were all in their plastic protective packs, I placed them into the basket. When I was at the store I thought I would have enough room for a couple of the paper pads as well. I guess I didn’t realize how much paper I had because the bin is full! I think I am going to get another one for the packs of paper. If anyone has any suggestions or ideas about the way they organized or would like to organize, please feel free to leave a comment! 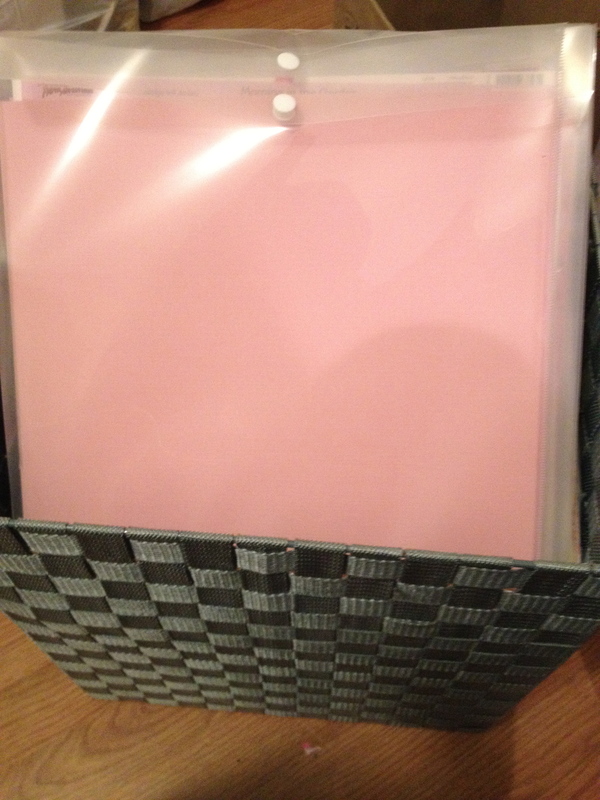 Posted in ideas, scrapbook tips, Storage and tagged file folders, loose paper, paper storage, solid colors, storage baskets, storage kits. Bookmark the permalink. How can you tie embellishments together? Often you will use several different ones in a single layout, but there is a lack of cohesion in them. Challenge number five addresses one way to help tie everything together to keep your page from looking choppy and make it appealing to the eye. For this layout I used four different papers (both patterned and solid) with the Spell Binders Nestability scalloped die cuts. For one of the layers I used a light pink paper that ended up not really going with my page. When something like this happens, I use distress inks to color in the paper. I chose Victorian Velvet and colored in the scalloped paper. For the photo mats, I used the same paper as the top and bottom scallops. Before I glued anything down, I placed all of the papers together and realized that even though they were all a shade of pink paper, they didn’t really flow. How was I going to make it work? My solution to this is to ink the edges of all the embellishments and photo mats. Since repetition and symmetry are pleasing to the eye, this helps tie everything together. 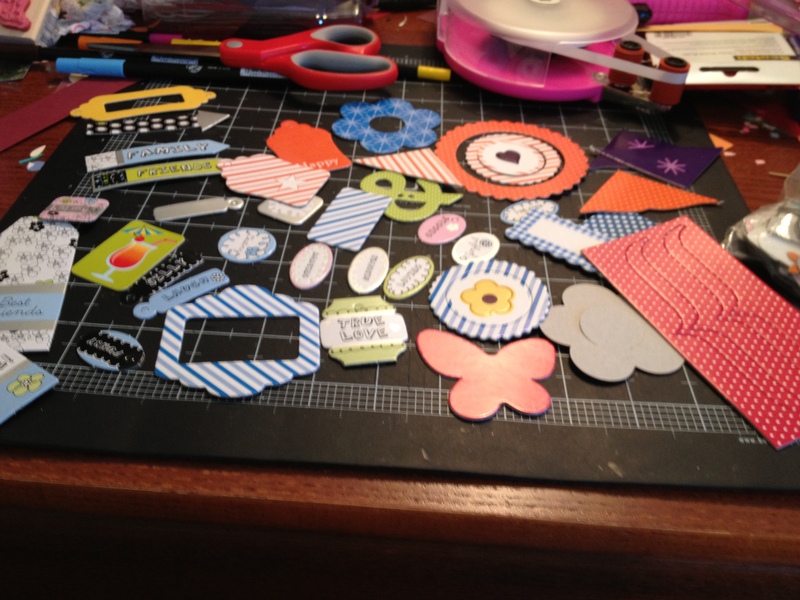 I inked up all the edges of the die cuts and mats and then glued them all together. Before I glued anything to the page, I cut off an inch from two of the sides of the patterned paper and glued that to a solid paper that coordinated with the patterned paper. Once all the pieces were secured to the background, I realized that I needed something to go in the bottom left corner. I had cut out a saying for an earlier layout that I didn’t use that said “Friends Forever” and thought maybe that would look good down in that corner. 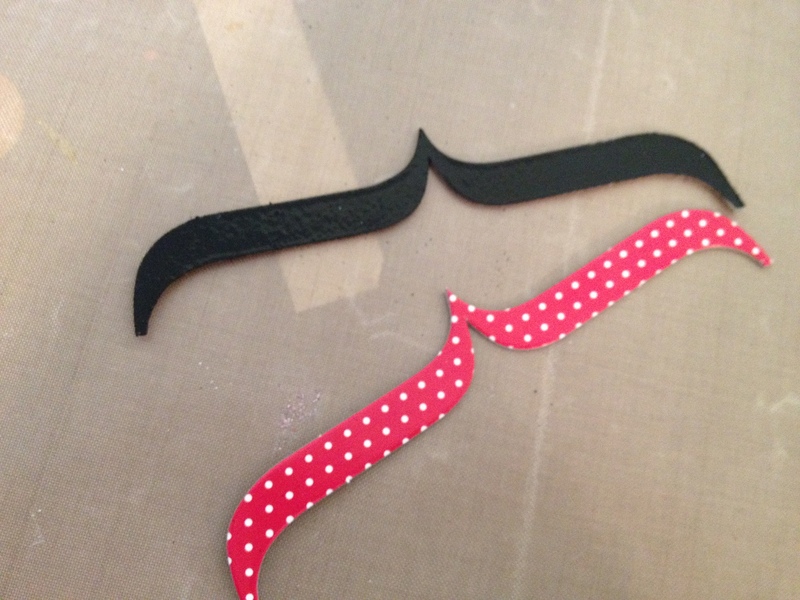 I actually liked it better on top of the die cut embellishment. I used a pair of the fancy scissors to create waves around the phrase and then I glued it down. Still needing something for that bottom corner, I looked online for a friendship quote. Once I found one I liked, I used VersaMark to ink up a quotes stamp I had and then used light pink embossing powder. 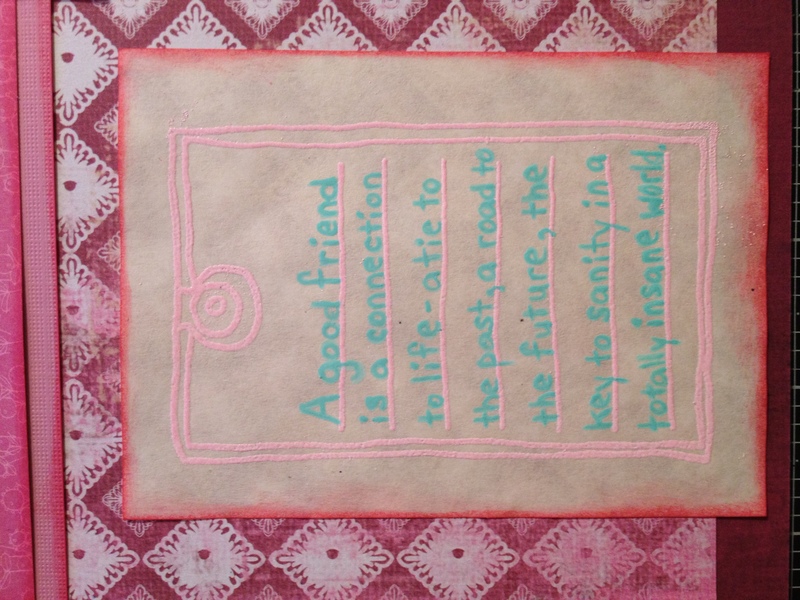 Since the “Friends Forever” was written in green, I used a green embossing marker to write in the quote. I inked up the edges with the same Worn Lipstick distress ink that I used on the other embellishments and glued it down. For the final touch, I took a square brad that I had lying around and covered it in a scrap from the patterned paper that was left over. I then used it in the space where the two photo mats overlapped. 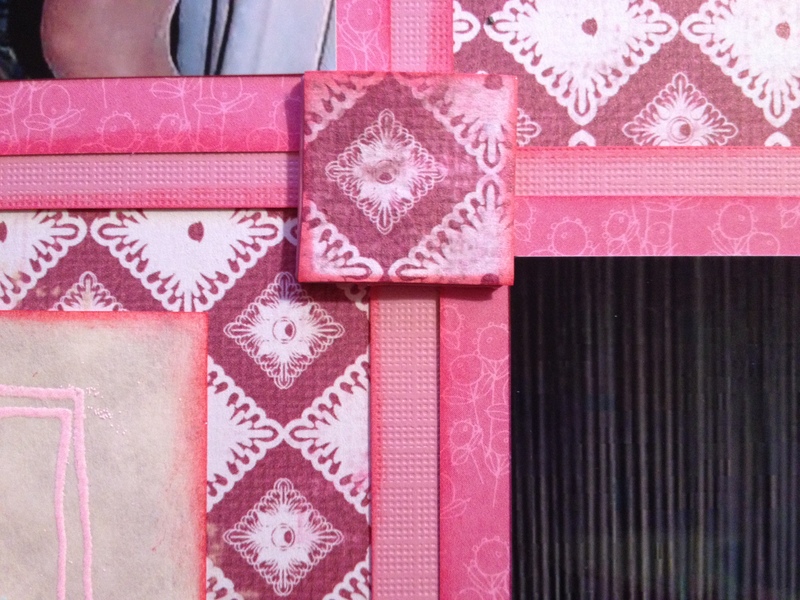 Before gluing the patterned paper to the brad, I also inked the edges in the Worn Lipstick distress ink. 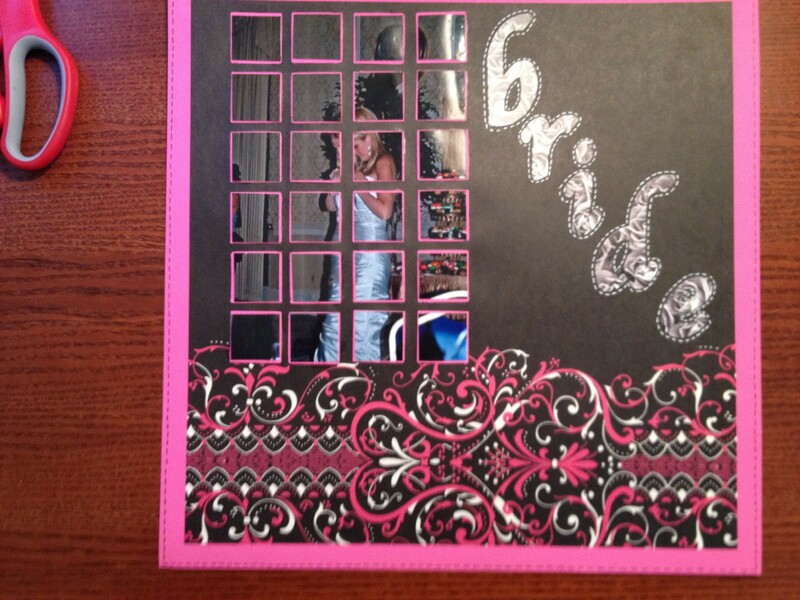 Using ink on the edges of your embellishments and photo mats helps tie everything together. Some people even ink the edges of their pictures. I hope this tip helps when you are creating a page and want to tie all the embellishments and photo mats together! 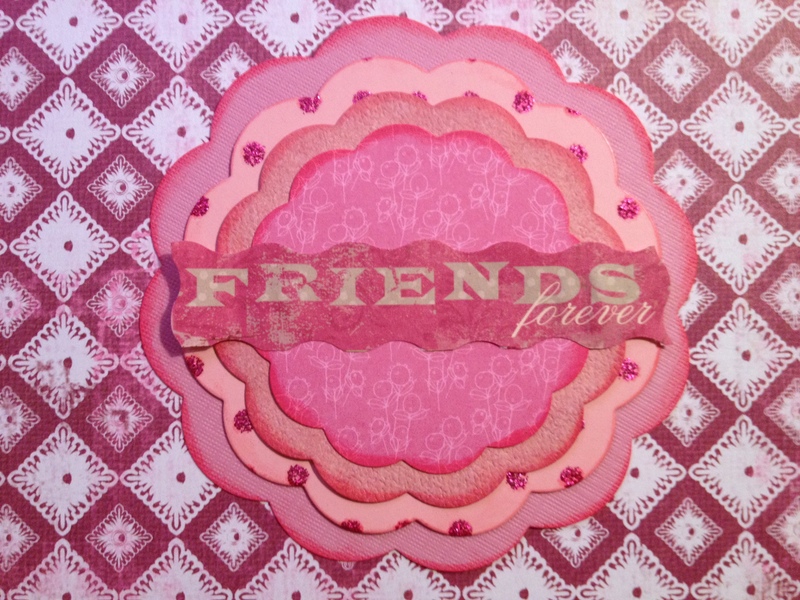 Posted in Challenge, distress ink, Embossing Powders, ideas, scrapbook tips, VersaMark and tagged brads, die cuts, distress ink, embellishments, Nestabilities, photo mats, scalloped circles, Sizzix, tying embellishments together. Bookmark the permalink. The technique to decided to try out for my fourth challenge is called masking. 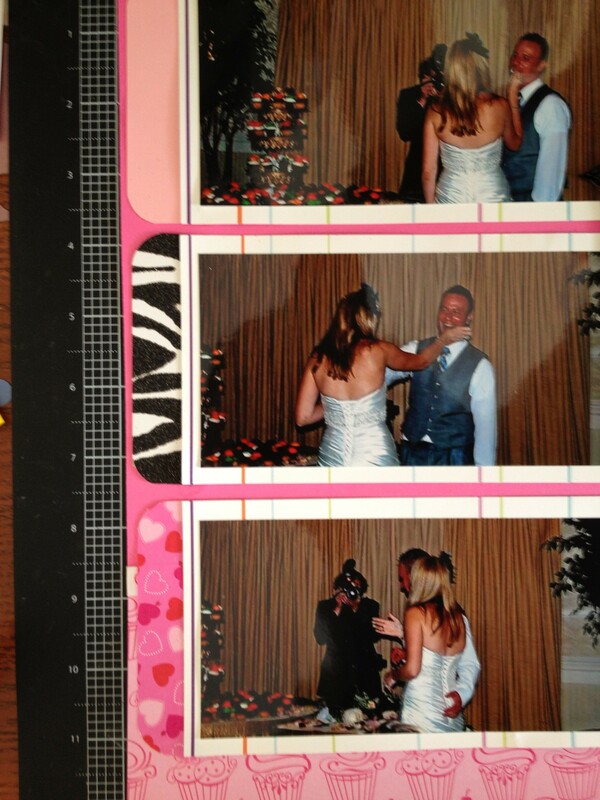 I chose two pictures of my friends Erika and Mike singing with the band onstage during their reception. Originally I had chosen a patterned background, but to do this technique, I had to switch it out for a plain white piece of paper. Since they were the stars of the day, I decided to use stars as a mask. I recently purchased a Martha Stewart stars punch all over the page punch and thought this might be a good place to try it out. 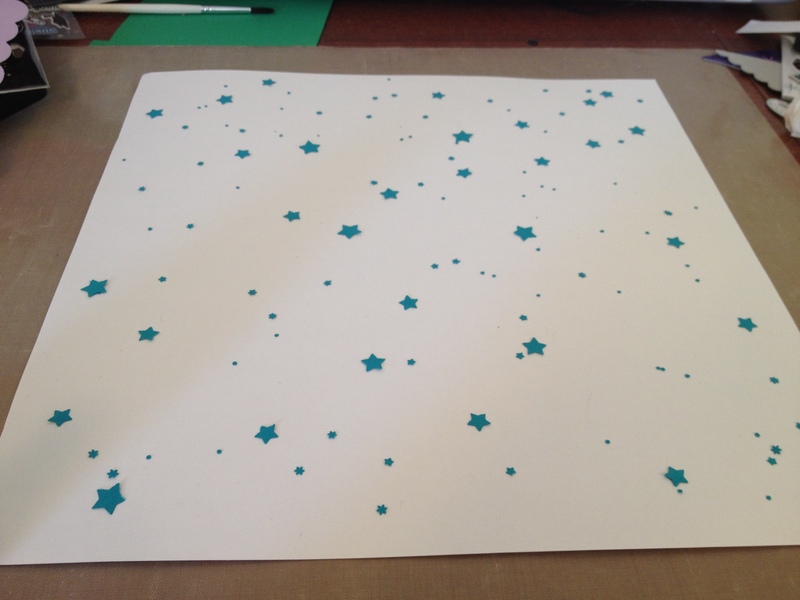 I used a scrap piece of teal colored paper and placed the cut out stars all over the plain white piece of paper. 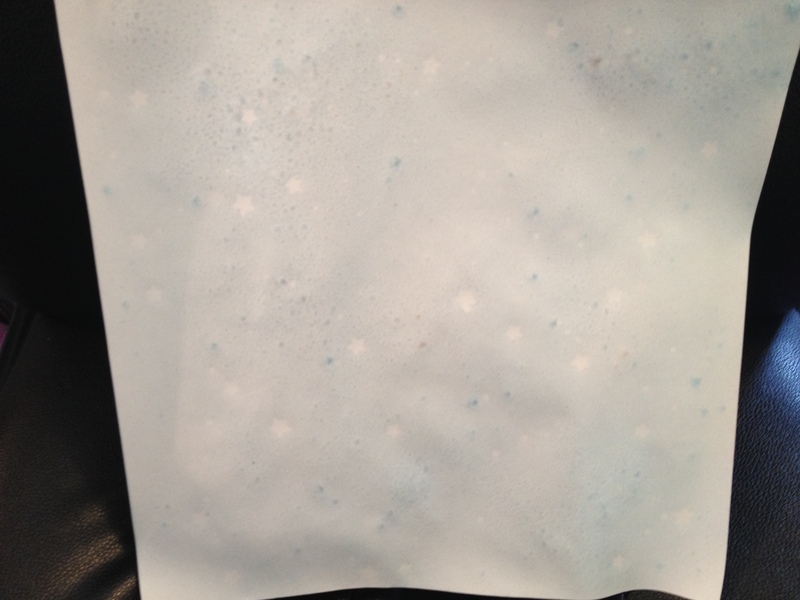 After the stars were placed where I wanted them, I then took a blue perfect pearls mist and sprayed the page. I then went back over it with a little bit of the pink perfect pearls mist. This is the result. *One note, next time I do this I think I will use the other part left over from the punch because doing it this way made some of the stars move when I went to spray them. Lesson learned! Once the page was misted, I used tweezers to remove the star pieces and then hit the paper with the heat gun so that it would dry faster. I found the patterned paper that I wanted to use for the photo mats and mounted them. I decided that the page needed a couple more pieces. As I am one that will use as many scraps as I can, I wanted to use the stars with the perfect pearl mist on them. 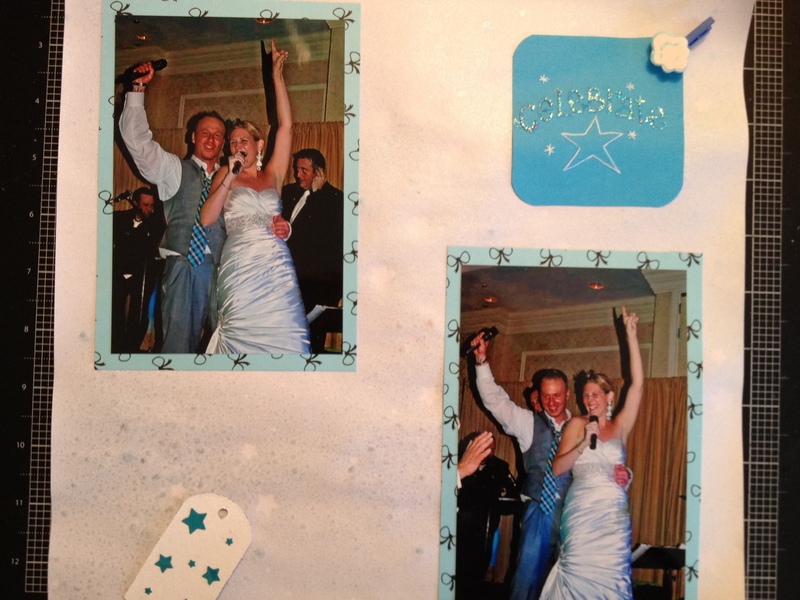 I took a piece of chipboard that I embossed with white embossing powder and glued down those teal stars. I plan on trying the masking technique again for another page soon! It was a fun way to turn a plain piece of white paper into something shiny with subtle background shapes. Posted in Challenge, Embossing Folders, Embossing Powders, ideas, scrapbook tips, VersaMark and tagged challenge, Embossing folders, embossing powder, Martha Stewart punch all over the page punch, Masking, stars, wedding. Bookmark the permalink. I am really excited about the way this layout turned out! For this challenge, I decided to incorporate two of the ideas that were on my list. These were using patterned papers from different collections or papers that you normally wouldn’t think went together and altering an item that you’ve had lying around for a long time. 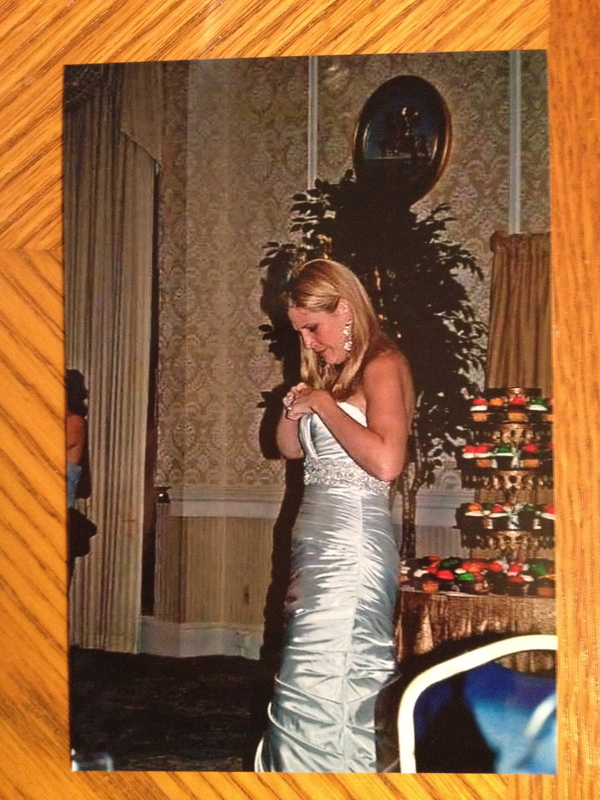 I again am using my friends Erika and Mike’s wedding pictures to tackle this challenge. The first thing I did was look for items that I have had lying around for a while. 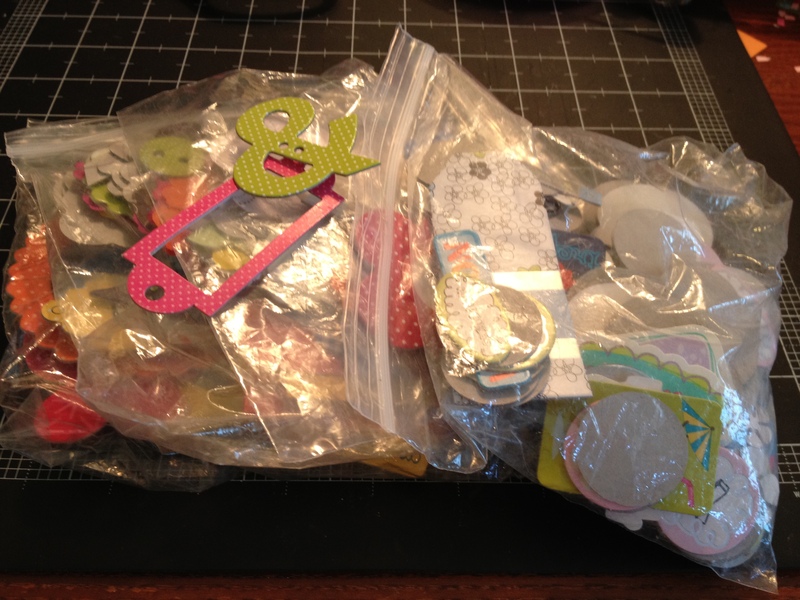 I have sandwich baggies of chipboard pieces that I bought from Target when I first started scrapbooking. I never used them because the colors or patterns weren’t just right for the layout. I chose a few that I thought might go along with the theme, but just may not have had the right colors or patterns. Usually if the color and pattern it came with wasn’t right, I wouldn’t even think about trying to incorporate it in my page. The next thing I did was pick my patterned and colored papers. I chose a pink card stock for the background and a two toned pink cupcake paper to be an accent paper. This is usually the point I would stop picking papers, but the challenge required the use of more patterned papers! 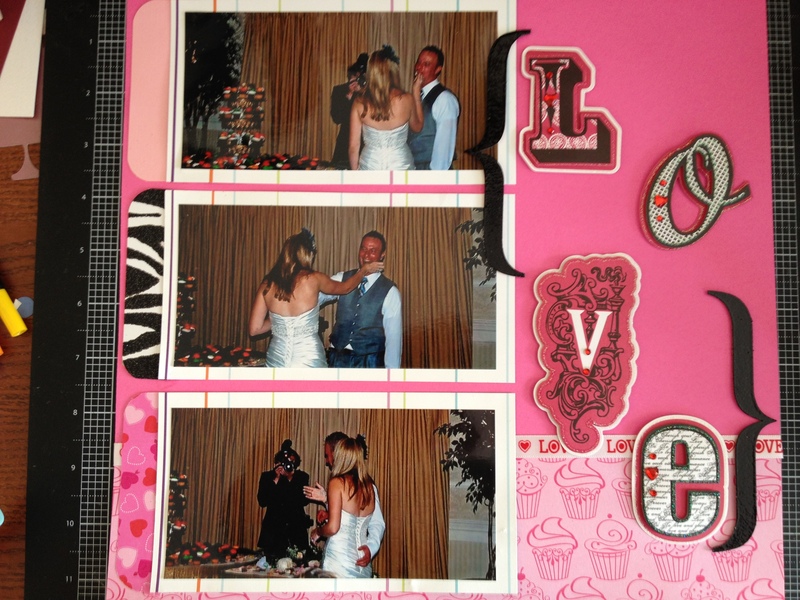 I then pulled out some scraps of zebra, pink hearts and a light pink paper that I had lying around. 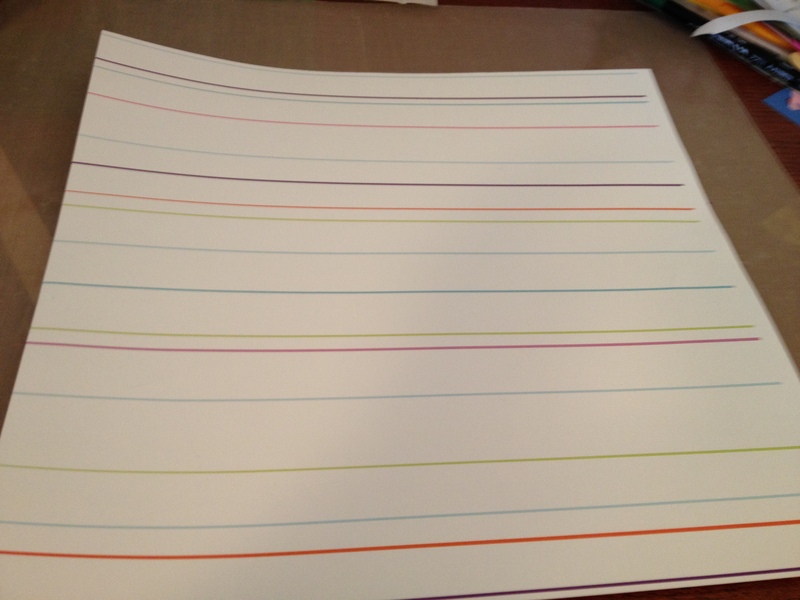 After looking at my choices, I also included a striped paper that I never would’ve even considered could work in this layout before the challenge! My next step was to see how these could all come together – or maybe I should say if they could all come together! I chose the striped paper as the mats for the photos, which I cut down (both the photos and the mats). Then I cut down the cupcake paper to a four-inch strip and used the “LOVE” ribbon so the transition between the two papers wasn’t so noticeable. After placing those papers together to see how they would look I realized that there was something missing from the right side of the page. I pulled out the “LOVE” stickers I had and decided that they needed a frame. I chose a set a parenthesis, but didn’t like the way the looked in the layout. They were too harsh, so I decided to try a technique I had seen in a weekly YouTube Video series from Two Peas called Glitter Girl. I used VersaMark on the undecorated (or raw) side of the chipboard and then covered it with black embossing powder. 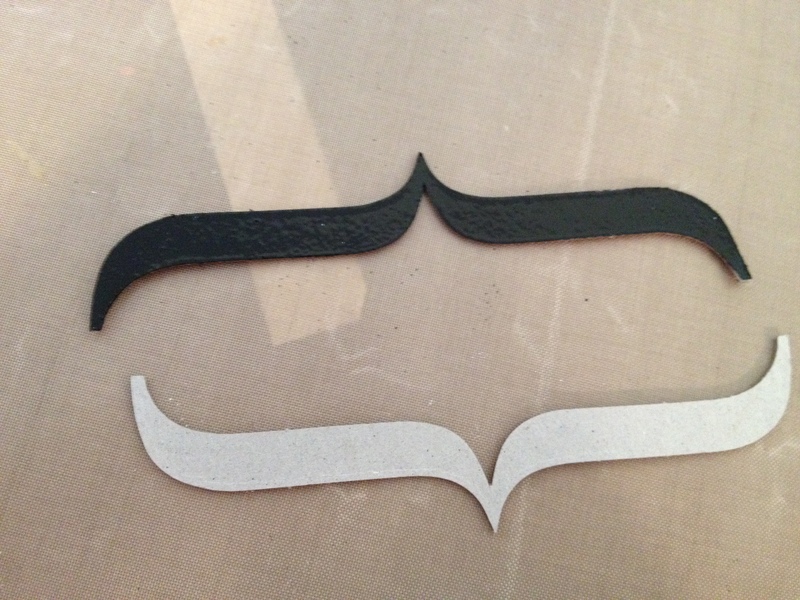 I then used the heat gun to set it and here are the results. 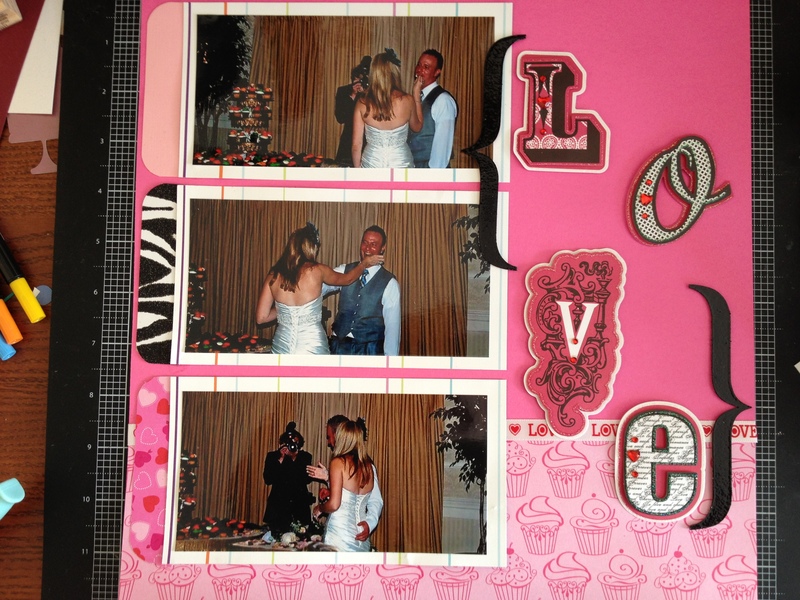 The next step was to glue down the cupcake paper and the “LOVE” ribbon. Once that was done, I laid the other pieces on top to see how it looked. The page still looked like it was missing part of the challenge – mixing patterned papers. 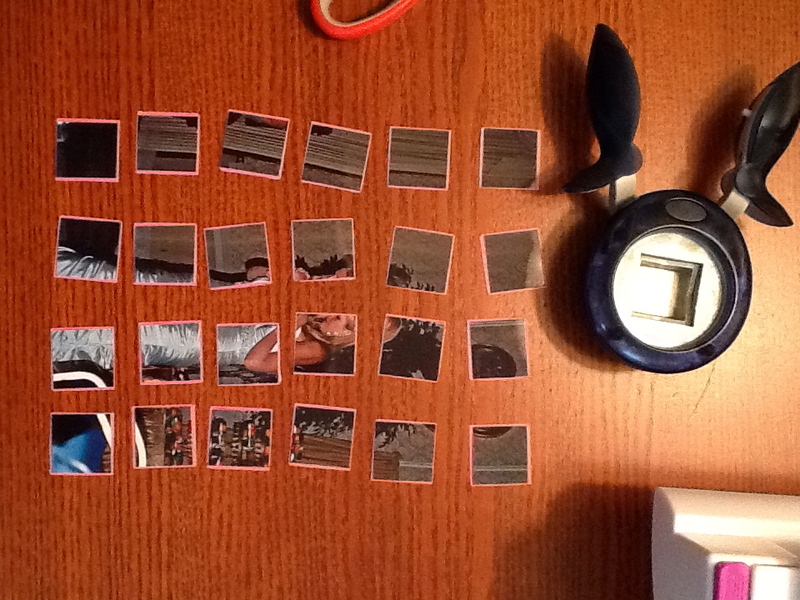 So, using a technique I saw on another video, I cut out three different rectangles the same size as the width of the photos and used my We R Memory Keepers corner rounder (at 1/2″) to round the ends of one side and use them as tabs on the end of my pictures. 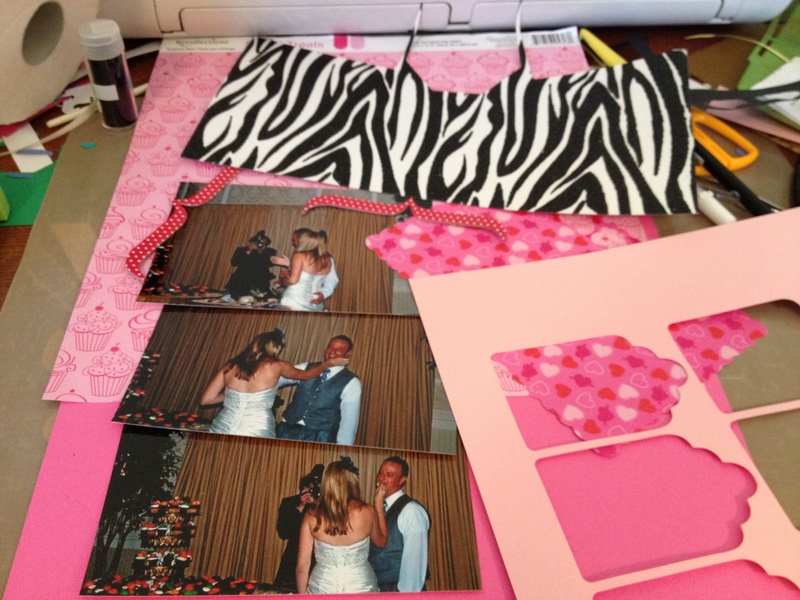 I chose the pink, zebra and hearts paper as the tabs and then proceeded to glue the pictures and tabs onto the layout. Finally I put the “LOVE” stickers down and then my embossed black parenthesis. Hope you like it! I am working on Challenge #4 now. Posted in Challenge, Embossing Powders, ideas, scrapbook tips, VersaMark and tagged altering chipboard, black embossing powder, chipboard, mixing patterned paper. Bookmark the permalink.